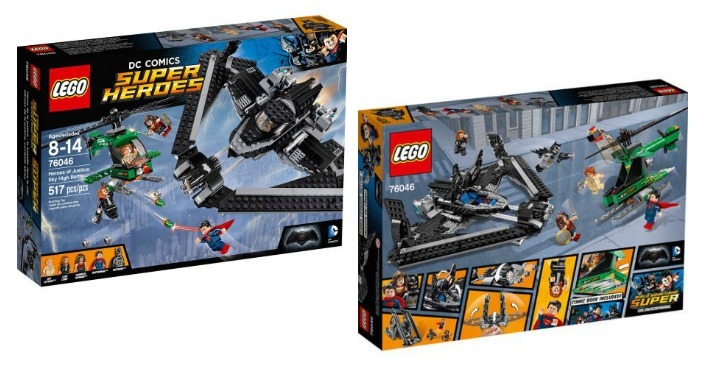 LEGO Super Heroes: Sky High Battle Just $37.59! Down From $60! You are here: Home / Great Deals / LEGO Super Heroes: Sky High Battle Just $37.59! Down From $60! Right now you can get this LEGO Super Heroes: Sky High Battle for just $37.59 (Reg. $60) at Walmart! Join forces with Super Heroes to take on Lex Luthor in thrilling battle high above Metropolis. Launch the Batwing with Batman in the cockpit and fold out the wings. Fly with Superman and Wonder Woman to stop Lois falling. Dodge the LexCorp helicopter’s Kryptonite flick missiles and fire back with the Batwing’s awesome rapid shooter. Then take the battle down to the streets with Batman’s grapple hook gun.